As Typhoon Mk1b fighter-bombers of 247 Squadron exit the target area near Falaise at full throttle, the havoc wreaked in their wake bears witness to the devastation of their powerful rockets. Fuel and ammunition from the retreating German column explode with shattering detonations, the savagery of the attack demoralising the enemy into stunned oblivion. The Typhoons will hurtle back to base to re-arm and hastily re-fuel, ready for yet another withering strike on the encircled Wehrmacht columns. 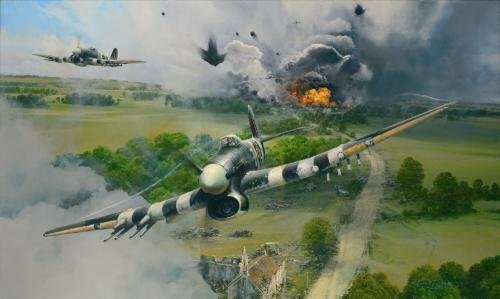 This stunning new rendition from the the worlds premier aviation artist pays tribute to the brave young RAF fighter pilots of the twenty squadrons of rocket-firing Hawker Typhoons who flew those perilous ground attacks during the Battle of Normandy. With each print in this new limited edition signed by pilots who flew in the thick of the action of the air war on the Western Front, knowledgeable collectors are given a rare opportunity to complete an important section in their valuable print portfolios. Every print in this edition has been signed by three hugely respected RAF Typhoon pilots who flew and fought in the skies over Normandy. Each print is also signed by the artist Robert Taylor, and hand-numbered. The Military Gallery is proud to publish this impressive edition to commemorate both the British Air and Land Forces who fought so valiantly in the grueling Battle of Normandy. Joining the ten RAF fighter pilots on the Typhoon Edition, each print is additionally signed by ten British Army veterans who fought in the Normandy breakout, making a total of TWENTY signatures in this edition.